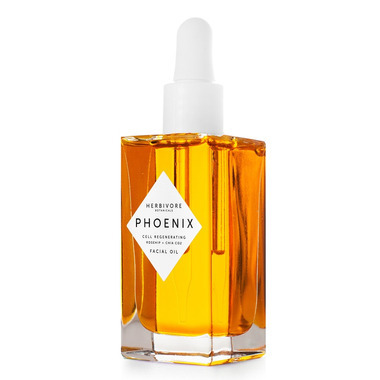 Herbivore Botanicals Phoenix Facial Oil allows your skin to regenerate with a blend of luxe botanical oils and skin cell renewing CoQ10. This oil will dramatically rehydrate and rejuvenate your skin at the cellular level. Leaves skin soft and silky with a renewed appearance and texture. Rosehip Oil - Naturally rich in fatty acids Omega 3, 6, and 9. All of which regenerate skin cells and repair damaged tissue. Sea Buckthorn Oil - The richest natural source of Beta Carotene available. Beta Carotene is a natural form of Vitamin A that penetrates deeply into the skin to restore and revitalize from within. CoQ10 - After the age of 30, the body produces less CoQ10 each year which in turn decreases the skin's natural collagen production and ability to regenerate skin cells Nourishing the skin with natural CoQ10 can increase the skin's collagen production, leading to greater skin elasticity and less fine lines and wrinkles. It also boosts the skin cells’ ability to regenerate on their own. Chia Seed Co2 - An excellent source of antioxidants and Alpha Lipoic Acid which helps to smooth fine lines and decrease inflammation. Meadowfoam Oil - Helps your skin form a protective barrier to lock in both moisture and nutrients. Neroli Oil - Softens wrinkles and reduces the appearance of veins and capillaries. Directions: Apply 3–10 drops to cleansed and toned skin both morning and night. Massage in and allow to absorb for 1–3 minutes before applying makeup. Store at room temperature and out of direct sunlight. this oil is absolutely wonderful. Itâ€™s made my skin so flawless and beautiful I can even go without foundation. it cleared up a dry patch that was resistant to every other thing I tried. I had a small patch of eczema on my arm for months and it healed that too after 1-2 uses. I swear by facial oils, and Iâ€™ve spent thousands on skincare. This oil is my holy grail elixir. Will repurchase forever. Second skin oil by this brand, love it! Move between this one and their lapis one. Smells lightly of roses, not overpowering. Add it with some cream moisturizer for extra hydration.